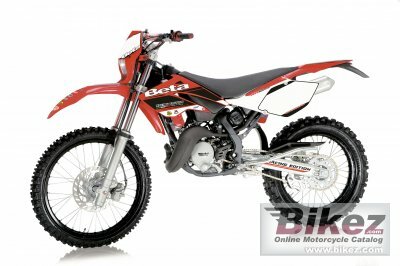 2008 Beta RR 50 Enduro Racing euro 2. Picture credits - Beta. Submit more pictures. Modifications compared to previous model: Main features: Dual radiators for higher cooling efficiency under stress, for consistent performance. No automatic oil pump, for lighter weight. Fuel: 2.5% synthetic oil mix. Straight-cut primary transmission with a reinforced clutch basket for a net reduction of mechanical loss. No counterrotating balance shaft, to increase engine responsiveness. Adjustable hydraulically damped 41 mm forks (hydraulic damping with spring preload). Monoshock with preload adjustment and hydraulic damping in compression and rebound. Even more progressive new linkage system, with aluminum connecting and rocker arms. Aluminum swing arm with a broader cross section, for increased strength and stiffness. Aluminum rims. Aluminum handlebars. New backlit digital instrument panel. Ask questions Join the 08 Beta RR 50 Enduro Racing euro 2 discussion group or the general Beta discussion group. Bikez has discussion forums for every moped. View comments, questions and answers at the 2008 Beta RR 50 Enduro Racing euro 2 discussion group. You can sign up for e-mail notifications when other riders answer you. If you have extensive experience with the MC, please send us a review. If you consider buying this bike, you should view the list of related motorbikes Look at photos. Compare technical specs. And check out the rating of the moped's engine performance, reliability, repair costs, etc. You can compare the rating with other bikes.